Wat past bij uw winkel? Now available: our new service signs (put them on the counter or place in any handy place on the wall or on a table in your store). To order signs we need your full company name, address and billing info. Shipping: Available in the UK and Europe (at the moment). The signs are made of 3 mm dibond (aluminium) and are printed in green or blue. Small (A6 format) – 12,50 each. Minimum order 50 pcs. Large (A5 format) – 15,00 each. Minimum order 50 pcs. Matching holder (cardboard) (optional) 3 euro each. Prices are in Euro, VAT recharged and exclusive of shipping costs. 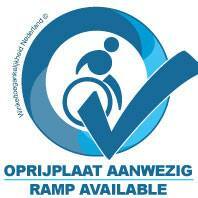 We deliver the signs to retail chains and nonprofit organisations* in the field of accessibility projects. *these nonprofit organisations get 20% discount, which will be returned after receiving full payment. Please chose number, size and color. After payment (we send you an invoice) delivery is within 10 days.